Contributed rendering by LOP LLC / A 49,000-square-foot grocery store is proposed for a tract of land on Signal Mountain at Taft Highway and Timesville Road. Proponents and opponents can sound off about a proposed grocery store and related retail and office project on Signal Mountain at a community meeting later this month. The meeting, on April 23 from 4-6 p.m. at the Development Resource Center in downtown Chattanooga, is expected to feature a presentation by attorney John Anderson. He's representing the group that recently bought the property at Taft Highway and Timesville Road in Walden. A community meeting on the proposed grocery store is slated for April 23 from 4-6 p.m. at the Chattanooga Development Resource Center, 1250 Market St. Some residents are already lining up for or against the proposed 49,000-square-foot grocery store, the identity of which hasn't yet been disclosed. 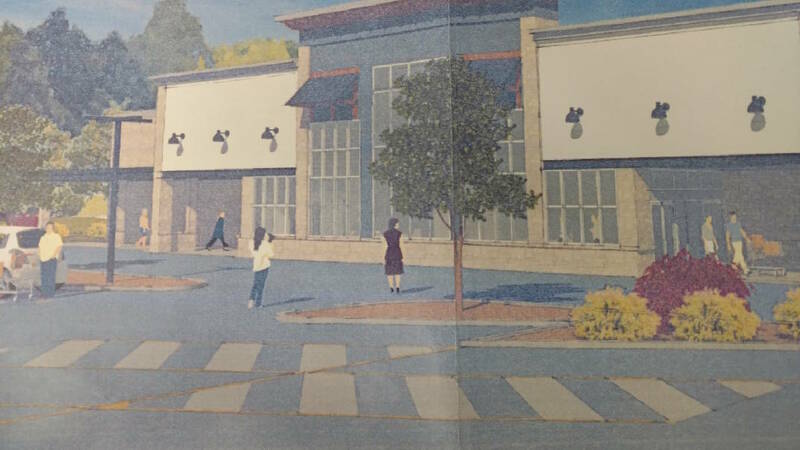 Last year, a developer proposed a Food City store in the town of Signal Mountain, but it was turned down by council members. Max Bahner, a longtime resident of nearby Walden, said he doesn't want to see "a new box store" at the site. "One of the things we were interested in was preserving the relaxed atmosphere on Walden," he said. "It's better for Walden and Signal Mountain to keep their uniqueness. You don't have to travel far to get the things you need from stores." But mountain resident Eddie Hayward said he thinks a new grocery store would be "real useful." "There's not that much here. It would be real helpful," he said, adding that people wouldn't have to drive off the mountain to go to a full-service grocery store. Richard Ford, who lives just in Sequatchie County, said he and his wife Sallie moved there six years ago to be in a rural community and it doesn't need such a new store. "It will expand the community undesirably," he said, noting increased truck traffic. Still, Sally Clemons, who also lives just in Sequatchie, said she would welcome a new grocery store. She said the prices at an existing grocer on Signal Mountain are too high as its owner knows the store doesn't have competition. Clemons said she travels off the mountain to shop at an existing Food City. Also slated to go on the proposed site of the current Lines Orchids Greenhouse would be a fuel center and 10,000 square feet of retail or office space, according to a rezoning request filed with the Chattanooga-Hamilton County Regional Planning Agency. Walden Mayor Bill Trohanis said he and the town board will look at what the Chattanooga-Hamilton County Regional Planning Commission does with the rezoning request. That panel is slated to consider the application on May 13. Walden officials also will look at the feedback they get from the community, Trohanis said, adding that he and board will make the final decision. "We work with our residents," he said. Bahner said that while there may be some new tax revenue generated by the development, "I'm not sure that's the best way to get it. There's a great deal to be said about having a place where people can be comfortable to live and keeping it simple." But, he added, he doesn't want to keep people from getting a new grocery store if that's what they really want. "If a majority wants that, that's democracy at work," Bahner said. Last year, Keith Corp. planned to build a 38,000-square-foot Food City behind what is now an existing shopping center in the town of Signal Mountain. That proposal drew supporters and opponents, too. Signal Town Council members said then that they liked the opportunity to bring the store to the town's center, but they couldn't ignore many town residents who were against the development.